But to me what is more important is the realization that there are pyramids all over this planet in every section of the planet, occupying places/cities far and wide. It makes me ponder at the agenda for having them all over. In different places they were used for different purposes, but it can’t be ignored that they are every where. My question is why do we have a planet covered with pyramids. Is there some “other’ mystical reason for these megalithic structures. And we must not forget Stonehenge in Europe. Or the huge round balls in Bosnia. I have read some studies about the Earth energetic being with a giant grid and the pyramids act like conduits to connect the energy i.e., primary nodal point of ever sacred spot on the planet are connected on this grid. And that quite possibly it is these conduits that keep this planet under lock down. In fact the pyramid grid also shows the placement of great churches, synagogues and Mosques on these primary and sub-primary nodal points. These placements are no accident. Why in the advent of the Pyramids have practically megalithic places of worship been erected? Before we go into the “my dog’s bigger than your dog” debate, we need to look deeper into the real reason and purpose for having a “dog” in the first place. Is it just to say how magnificent the civilization was? If so, why are we left with just remnants. Are they there for comparison and to determine the strength, value, heroism, quality of life than another culture? Are they simply tourist sites and have no contemporary value or significance? Why have they been discovered to have Astrological, Metaphysical and even Earth based indicators that have people coming to them from all over the world to observe, and/or be enchanted by them? Who put them there in the first place? 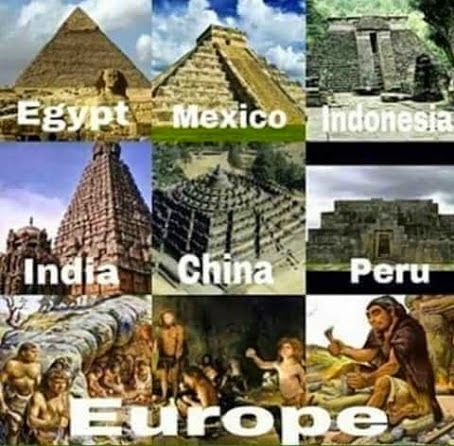 Are we saying that primitive people with stone tools built these structures in the time it would take modern day man to do over decades.. Maybe even longer than that? Are we even being told the truth about their origins and purpose and if so, why would one be used to feed the gods and another to sacrifice the lives of virgins to the gods? Why? I think if we just take a moment and get over ourselves and realize what it took to even put these stone megaliths in place, the labor, the manpower down to the destruction of a neighboring environment it should cause us to stop and think. How do we know that removing all them big rocks and stones, didn’t cause great floods, or disruption of the Eco-system. What I am proposing is that we take a little more time before we make a supposition and see what we can research on this and find out what these pyramids really mean and what use do they hold for us in modern times. In closing I suggest that we live on a planet that has been structured by a particular Architect or assembly of Architects with an express purpose of creating a model, specific to this planet. Thus they have transplanted a pyramid culture that impacts on all life on this planet and any life that observes this planet. These pyramids are telling the Solar System, the Galaxy and the Universe we live in, who we are, how we got here and why we are here. This entire planet is a pyramid civilization, a pyramid culture (see Mars Pyramids). When the true purpose of these facts are studied with an objective eye, we may come to “See” what the “Others” see when observing this planet and the life forms upon it. “There are also a couple in the US, though they are more correctly “mounds” – Cahokia in Illinois and Etowahin Georgia. “Or… we can look at what the geologists who’ve been out there have said: That they are hills. They’ve removed all the first and vegetation (how would it get on top of a large manmade structure anyway?) and have been using the remains of the Roman Villa, a medical era cemetery, and in some instances have been caught hoaxing inscriptions to show evidence of a culture. Robert Schoch, a well known proponent of a much earlier date for the pyramids at Giza, investigated the site and reported that inscriptions appeared in a cave that had not been there to begin with. “There are quite a few seemingly. Silbury Hill, Wiltshire has been carbon-dated at 2660 years BC, the same era as the Giza pyramids. It contains an estimated 340,000 cubic metres of chalk and earth, rising to a height of 39.6 metres. The base of the monument is 167m in diameter and it is perfectly round. The flat top is 30m across. It is part of a sequence of ancient sites in the area that are in alignment. Despite its external appearance, this is actually a step pyramid, consisting of six, six metre high steps. The steps are walled with blocks of chalk, which easily deteriorates when left exposed. Consequently the builders preserved it, by covering it with earth and grass. Excavations have revealed that it is not a burial mound. Few sights-or sites for that matter-can compare to the grandeur and majesty of the Ziggurats and the Pyramids. If you are looking to get a feel for the ancient civilizations on your next trip or vacation, few destinations can compare to these two for sheer historical value. Of course determining which one of these two is the “best” is an exercise in futility, as each will have its own merits and drawbacks. It would perhaps be better to point out their key attributes in the interest of helping you make a more informed decision and that is precisely what this comparison aims to do. In the months before he ordered the invasion of Iraq, George Bush and his senior officials spoke of preserving Iraq’s “patrimony” for the Iraqi people. At a time when talking about Iraqi oil was taboo, what he meant by patrimony was exactly that — Iraqi oil. In their “joint statement on Iraq’s future” of April 8, 2003, George Bush and Tony Blair declared, “We reaffirm our commitment to protect Iraq’s natural resources, as the patrimony of the people of Iraq, which should be used only for their benefit.” In this they were true to their word. Among the few places American soldiers actually did guard during and in the wake of their invasion were oil fields and the Oil Ministry in Baghdad. But the real Iraqi patrimony, that invaluable human inheritance of thousands of years, was another matter. At a time when American pundits were warning of a future “clash of civilizations,” our occupation forces were letting perhaps the greatest of all human patrimonies be looted and smashed. There have been many dispiriting sights on TV since George Bush launched his ill-starred war on Iraq — the pictures from Abu Ghraib, Falluja laid waste, American soldiers kicking down the doors of private homes and pointing assault rifles at women and children. But few have reverberated historically like the looting of Baghdad’s museum — or been forgotten more quickly in this country. In archaeological circles, Iraq is known as “the cradle of civilization,” with a record of culture going back more than 7,000 years. William R. Polk, the founder of the Center for Middle Eastern Studies at the University of Chicago, says, “It was there, in what the Greeks called Mesopotamia, that life as we know it today began: there people first began to speculate on philosophy and religion, developed concepts of international trade, made ideas of beauty into tangible forms, and, above all developed the skill of writing.” No other places in the Bible except for Israel have more history and prophecy associated with them than Babylonia, Shinar (Sumer), and Mesopotamia — different names for the territory that the British around the time of World War I began to call “Iraq,” using the old Arab term for the lands of the former Turkish enclave of Mesopotamia (in Greek: “between the [Tigris and Eurphrates] rivers”). Most of the early books of Genesis are set in Iraq (see, for instance, Genesis 10:10, 11:31; also Daniel 1-4; II Kings 24). The pyramids at Giza, on the outskirts of modern Cairo, are perhaps the most iconic of all Egyptian monuments, and they mark the high point in the engineering skills first displayed by Imhotep in the previous dynasty. The largest, the Great Pyramid, shown here furthest from the camera, remains the most massive freestanding monument ever raised by humankind. The 4th Dynasty was the period at which many of the institutions of the state appeared in mature form, and the art of this dynasty became firmly established in the canons that would endure until the end of Egyptian civilisation. A team of daring Chinese researchers, digging into the ancient mysteries of the origin of their country, have come to the inescapable conclusion that 12,000 years ago, an interstellar supreme alien race used much of the northern and central Chinese regions as massive Earth bases.